Ed Ruscha drove his old Ford pick-up from Oklahoma out to Los Angeles in 1955. His prints have commemorated that California migration ever since. Ruscha’s traverse across the Southwest was an alluring progression of modernist structures and brightly-lit language. Into California Ruscha imported the ethos of Walker Evans, New York-streetscape photographer, and of Charles Sheeler, painter of industry, where he has since enlivened the art scene for decades. That 1939 Ford truck provided a subject for Ruscha’s earliest lithographs and the western migration miles upon miles of motivation. After compiling Twentysix Gasoline Stations, a book of photographs from across Arizona and Texas, Ruscha acquiesced to an admirer of his painting of a Standard Oil gas station and began a prints series. His various screenprints depicting Standard Oil stations captured what Ruscha dubbed a “landscape once removed” with an angular view that was “. . . modeled after the way Bambi’s father stood in the forest.” The splashy background of lot 77, Cheese Mold Standard with Olive, resulted from the challenging “split fountain” technique whereby a squeegee blended multiple pools of colored inks seamlessly. Ruscha noted that “often when an idea is so overwhelming, I use a small unlike item to ‘nag’ the theme.” So into this iconic and accessible image Ruscha dropped one olive. Ruscha aspired to “. . . the idea of a word becoming a picture, almost leaving its body, then coming back and becoming a word again.” By the 1970s his ready-made outlook was admittedly Duchampian. Ruscha was among some artists who produced prints for an American installation during the 1970 Venice Biennale that featured an onsite printshop. Ruscha was fascinated by Duchamp’s 1913 print The Chocolate Grinder; at the biennale he exhibited prints made from sundry chocolate onto which onlookers traced words. With surrealism in mind Ruscha created lot 247, Bowl, from the 1974 Domestic Tranquility series. In 1974 Ruscha also experimented with film and recalled that “I would forget the story [of movies] but remember the emotion.” His second moving picture Miracle, 1974 featured actress Michelle Phillips and artist Jim Ganzer. An immediately subsequent photographic series published by Gemini G.E.L. revealed Ruscha’s new interest in light. Then, the 1977 print Miracle depicted bright beams of light, though lacked the narrative of words or figures. Ruscha observed that “Words have temperatures. . . when they reach a certain point and become hot words, then they appeal to me.” Lot 76, the 1999 lithograph Miracle, coupled the uplifting text “Miracle” in delicate cursive together with a warm and comforting glow. Another result from the collaboration with Miracle actor Jim Ganzer was lot 75, Sea of Desire, a print signed by both Ruscha and Ganzer. Ruscha’s “suggestors” were a legacy of the “spill-fountain” technique that provided rich backgrounds for his early pieces. The “suggestors” of Ruscha’s later works were intriguing backgrounds that heightened words’ intensity. 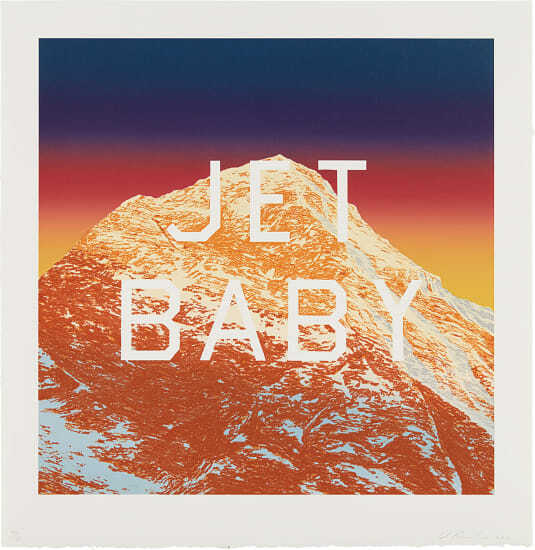 Lot 74, the 2012 lithograph Jet Baby, layered an intriguing phrase atop a technicolor background that rested behind a dramatic snow-covered mountain. Published at Hamilton Press, the work resulted from another long partnership — between Ruscha and lithographer Ed Hamilton — that culminated with Hamilton Press’ founding in Venice Beach during the 1990s. The workshop remains open to artists who approach it with independent projects. Signed, dated and numbered 40/50 in pencil (there were also 19 artist's proofs), published by Hamilton Press, Venice, California, (with their blindstamp), framed.